Edwin Jackson has said it countless times since his Oakland arrival in late June: there is something special about this A’s team. 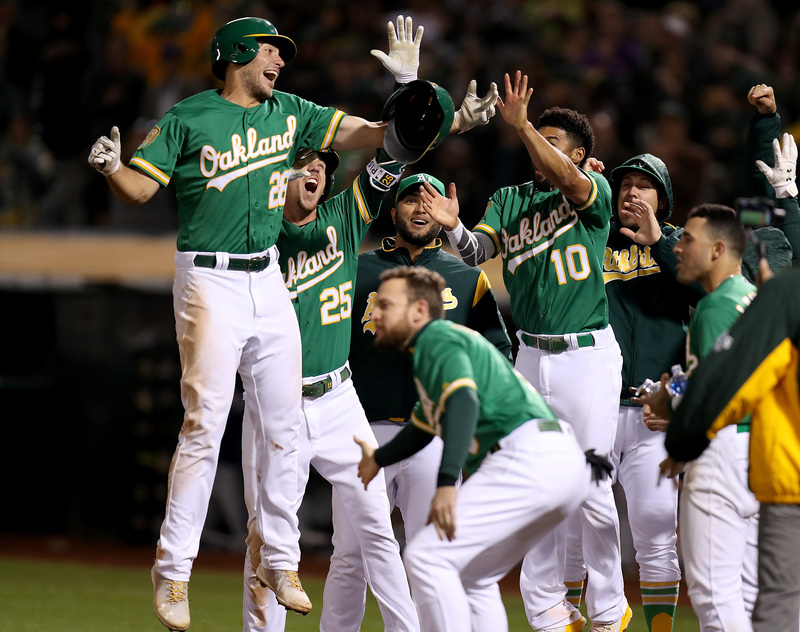 The Athletics showed their special grit once again Saturday, overcoming a Jeurys Familia blown save to score a second-straight walk off win, 3-2, over the Twins and lower their magic number for a playoff berth to 1. Oakland got a couple huge assists from the Twins in the ninth, and didn’t let them pass by. 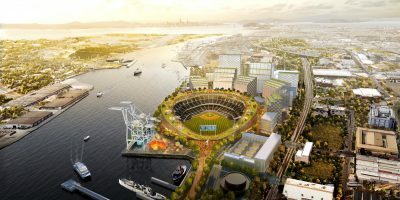 Like so many rallies of late, though, things started for the A’s with Stephen Piscotty, who hammered a double down the left field line to lead off the ninth tied 2-2. With one down, Marcus Semien chopped a grounder to his opposite number. Shortstop Jorge Polanco bobbled a routine grounder, and while he recovered quickly, Semien, busting it down the line, reached on the error. Minnesota intentionally walked Matt Joyce. Mark Canha, with the bases loaded, one out and five men in the infield, went down swinging. But not until after he forced 11 pitches from Trevor Hildenberger (L, 4-5, 4.77 ERA). The next pitch he threw scooted past his catcher and to the backstop as Piscotty scampered home with the winning run making the A’s the recipient of their first walk-off wild pitch since April 26, 1997. Mike Fiers bounced back nicely from his first loss as a member of the A’s but found himself trailing 1-0 early when rookie catcher Willians Astudillo doubled to lead off the third and scored on a sacrifice fly. He was far from perfect but held the line from there. Fiers (ND, 12-7, 3.31 ERA) lowered his ERA in Oakland to 2.90, holding the Twins to four hits and one, walking one and striking out five, over six innings. Melvin used the word “terrific” and “consistent” when describing the veteran right-hander who has led the A’s to an 8-1 record in his nine starts in Oakland — he personally is 6-1. Looking for his first win as a major leaguer, Minnesota starter Chase De Jong (ND, 0-1, 3.86 ERA) danced around loud contact early. Through the first four innings the A’s owned the four hardest-hit balls of the night, but barreling the ball wasn’t enough as each resulted in outs. Finally, in the fifth, the luck ran dry on the former second-round draft pick. Semien put the A’s ahead three batters into the frame with a liner that found a the perch atop the American League out-of-town scoreboard for a go-ahead two-run homer (13). After homering seven times through the first 4-1/2 months of the season, Semien, who led all shortstops in long balls in 2016 (27), has found his power stroke launching six in 39 games since. For the second day in a row, though, once called upon, the Oakland bullpen couldn’t hold the line. This time it was Familia who let the Twins back into the game, surrendering an Astudillo RBI single. While Familia, Fernando Rodney and Lou Trivino continue to search for the dominance they had displayed earlier in the season, Ryan Buchter continued his emergence as the shutdown southpaw the A’s was hoping for when they traded for him in January. With his scoreless inning of work Saturday night, the veteran lowered his season ERA to 2.95 — he has allowed two runs in 21 games (13 innings) since Aug. 1. As Melvin said before Saturday’s game, the A’s will not steer away from their big guys in the back-end of the bullpen, regardless of their recent numbers. And recent numbers aside, the goal has quickly become, get the ball to Blake Treinen. Treinen (W, 9-2, 0.81 ERA) endured his worst outing nearly a month, an outing that included one hit, one strikeout and no runs in one inning. The Oakland closer has not blown a save since mid-July. Also, his ERA is the lowest among AL pitchers with 12 or more innings pitched and his 4.1 WAR is 10th-best among all AL pitchers. The goal for the A’s will once again be to get the ball to their Cy Young-hopeful closer with a chance to win and clinch Sunday. With a 3-2 10-inning win over the Orioles, the Yankees clinched their spot in the postseason and remain 1-2/2 games ahead of the A’s in the race for the right to host the Wild Card game. … The Rays lost in Toronto lowering their elimination number to two. … The Astros overcame an early deficit to beat the Angels and keep a firm grip on the AL West race. Oakland remains 3-1/2 game behind Houston with seven games left on the schedule. … Despite a 13-0 win in Texas, the Mariners were eliminated from playoff contention with the A’s Saturday night victory. Bob Melvin hands the ball to Trevor Cahill (6-3, 3.77 ERA) Sunday as the A’s look to clinch a playoff berth. Kyle Gibson (8-13, 3.78 ERA) and the Twins will stand between them and that fate. Trevor Cahill, who will start Sunday’s regular season home finale, will be returning from a 14-day injury hiatus (back). Cahill is 5-0 with a 1.49 ERA in 10 home starts this season. His last start, 2-2/3 innings and three runs allowed, was Cahill’s worst start in Oakland this season. … Saturday night was Jed Lowrie’s 128th start this season at second base. 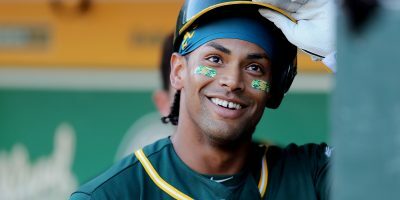 With Matt Olson (146 at first), Matt Chapman (138 at third) and Marcus Semien (151 at shortstop) this marks the first time in Oakland history in which the A’s had one player make at least 128 starts at each infield position. … Blake Treinen allowed a Willians Astudillo two-out single in the ninth. It was the first hit Treinen allowed since Aug. 23, ending a streak of 14 scoreless innings which ties the Oakland franchise record set by Sean Manaea in April of this season. … Ryan Buchter has now stranded 19 consecutive inherited runners and has not allowed one to cross the plate since July 21.